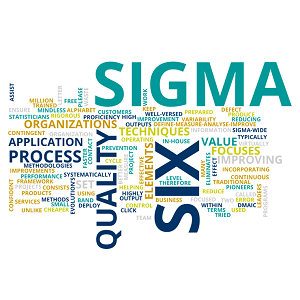 Six Sigma is a rigorous, focused and highly effective implementation of proven quality principles and techniques. Incorporating elements from the work of many quality pioneers, Six Sigma aims for virtually error free business performance. Sigma is a letter in the Greek alphabet used by statisticians to measure the variability in any process, and if you can keep the output of that process within a six sigma-wide band (in effect, no more than 3.4 defects per million outputs), you can be confident that your process is operating as it should. Six Sigma focuses on improving quality (and therefore reducing waste) by helping organizations produce products and services better, faster and cheaper. In more traditional terms, Six Sigma focuses on defect prevention, cycle time reduction, and cost savings. Unlike mindless cost-cutting programs which reduce value as well as quality, Six Sigma identifies and eliminates costs which provide no value to customers. Typically a Six Sigma project consists of two elements. Using a framework called DMAIC (Define-Measure-Analyse-Improve -Control) organizations set out to deploy a set of tried and tested improvement methods and second a small contingent of in-house six sigma leaders are trained to a high level of proficiency in the application of the aforementioned techniques to ensure the improvements are sustainable and continuous. Accelerate Evolution’s team is well-versed in the practical application of Six Sigma methodologies and we are more than prepared to assist your organization with its Six Sigma projects.